What is an AFFF Fire Extinguisher? While firefighters have existed for centuries, some of their most valuable tools have only existed for a relatively short time. In the case of fire suppressant foam, firefighters have only had access to it for just over one hundred years. Fire suppressant foam was invented by Russian chemist and engineer Aleksandr Loran in 1902. The intent of it was pretty simple -- to create a safer, more effective fire suppressant than water. Needless to say, after a century of use, it has developed into subcategories like AFFF, which has established itself as a staple among both professional and amateur firefighters. It works pretty simply -- like water, AFFF cools the fire and disperses its accelerants. It also coat the fire in a sealing film which prevents oxygen from reaching the blaze. In addition to that, AFFF has several fire retardant chemicals and solvents in it making it particularly effective against Class B hydrocarbon fuel fires. It’s a well-rounded solution to frequently encountered classes of fires. One particularly interesting aspect of firefighting foam is its ability to expand. Based on a rate of expansion around 20x that of its initial volume, fire suppressant foam is suited for different types and scales of blazes. In the case of AFFF, with an expansion rate of less than 20x its initial volume, it’s considered a low-expansion foam and is best used for fire spread across large areas. 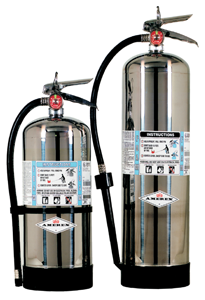 AFFF fire extinguishers are designed to be very mobile, allowing the user to cover lots of area if a fire has spread. They are therefore ideal for outdoor burns, where a high-expansion foam would be preferable for indoor and warehouse use. Firefighting has come a long way since bucket brigades. For over a hundred years, technology has continuously advanced our ability to fight fires of different sizes and compositions. At the forefront of this fight is AFFF, a type of foam that combines the cooling and smother benefits of water with fire retardant chemicals. The most common types of fire most people will encounter are Class A and Class B fires, which AFFF fire extinguishers are well-equipped to face. If you’re looking into fire suppression solutions, it’s important to consider how AFFF will suit your needs.